Opening comments to the the partner, partner, partner panel are provided in this brief video. 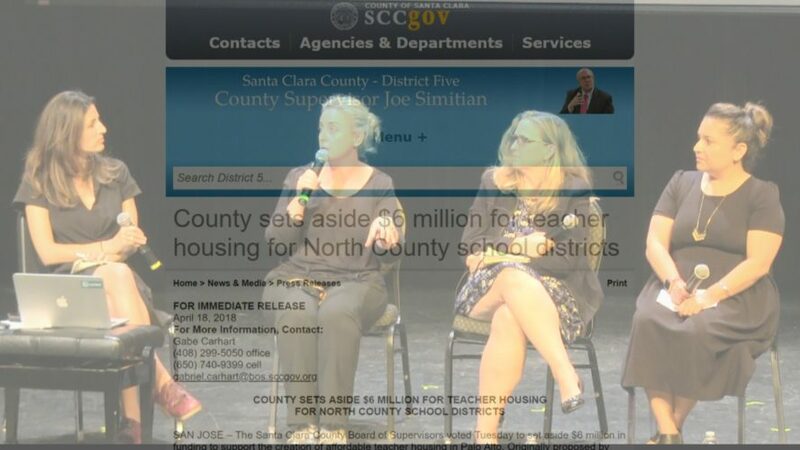 Sarah Chaffin discusses her initiative, SupportTeacherHousing.org and the work she has done to help bring housing for teachers in various parts of Santa Clara County. Debra McKoy talks about the work she is leading at the UC Berkeley Center for Cities and Schools at the Institute of Urban and Regional Development to bring cities and school districts together in finding housing solutions. Vianey Nava talks about the work that the Housing Trust Silicon Valley is doing to solve the housing crisis, including the initiative she is leading to help homeowners build ADUs on their properties. Nikki Lowy discusses how Landed is helping teachers purchase their respective first homes. A great panel discussion of the opportunities for partnerships between different entities. It requires patience, perseverance and initiative. Let’s get it done.